Sometimes life is rainbows and butterflies. Of course the standard answer from Prima when I ask her what rainbows are is, “Unicorn farts.” Awesome parenting once again but today’s story will not focus on mythical flatulence. Today will be all about the butterfly. It all started when Santa brought a Butterfly Garden on Christmas Eve. Jane received the gift along with her tent because it supported an outdoors theme. Immediately upon figuring out what the Butterfly Jungle was all about, she insisted on ordering caterpillars. Now for those of you who have been reading for a while you might recall we have trouble raising anything with the ability to die. Outside of larger mammals that can fend for themselves like the cat and dog. We have accidentally killed lots of things through misunderstanding or sheer bad luck. Feel free to catch up on that here. Surely, we thought, Butterfly Garden could be different. The instructions said that you buy the caterpillars and put them inside. Boom. Done. Seal it up and watch them go. That sounded pretty fool proof so we thought that we might as well try and it falls under “Educational Experience” so it was for the children. We check the website and sure enough you can order caterpillars at any time and they ship in a couple of days. Jane was on her best behavior for a full three hours one day in mid-January and convinced us to order. A few days later a package arrived at the house. 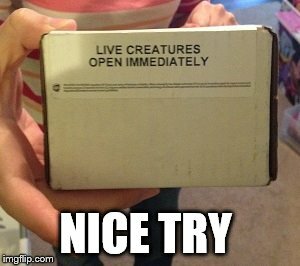 I had forgotten that caterpillars were coming in the mail so the package confused me for just a minute. They might want to consider some extra description because the mailman still looks at me strangely. So these little dudes crawl around a food paste in a plastic cup and grow into big fat worms. Once they attach to the paper in the lid of the cup you have to transfer the paper and all of the hanging pods to the Butterfly Habitat (ie. Plastic cylinder with paper aquarium-like background). The transfer was trickier than I thought it would be. 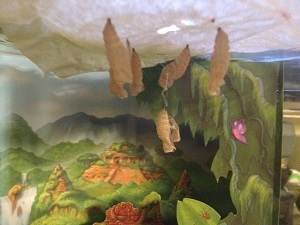 The cocoons are barely hanging from the paper and when they feel movement they start swinging back and forth wildly. Think of a magician in a straight-jacket hanging by his feet and violently trying to get free. That is what it looked like to me. This is about the time when things start to go south for the butterflies. One of the pods falls off and the online instructions said that cocoons that are on the ground will die. So I use a piece of tape and attach the end and hang the little dude back up in the air. I guess the tape covered an air hole or something because it turned black and died. That wasn’t nearly as disturbing as the ones that lived. About day seven they started dripping blood. Dark red liquid oozed out of the ends and splattered the ground below. More online reading assured us that the liquid was just a byproduct of wing color development. Another milestone passed. Then the first butterfly emerges and crawls around the box. It is too fat to fly and the wings have to dry off so we have to wait for the majestic Butterfly Habitat experience. That doesn’t mean that the girls don’t still want to look so we try to turn the box so the girls can see and the new butterfly falls and is wedged between the aquarium-backdrop and the side of the box. They can see very clearly that it is wedged in really good and cant crawl out. The only problem is that we have five other pods at the edge of hatching so we don’t want to ruin them too. Sorry buddy. Another one bites the dust. While further researching as to whether or not we can touch them and save the abandoned first born son, we realize that another step had been skipped. They needed food and the recommended setup was a slice of banana in a shallow dish of sugar water. Dammit. Now we have to open this thing anyway and soon because it will be easier to do this before all of the butterflies emerge. We managed to get the food and sugar water in place and the lid closed just as another butterfly emerged. *Phew* Then another. Then another. “Okay this is going really good”, I thought. There were some brave soldiers who didn’t make it but we were going to win the war. 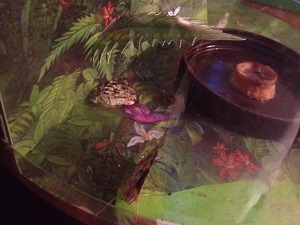 Then I look into the enclosure and notice one of the butterflies had fallen face down into the sugar water and drowned? Maybe placing the watery death trap directly below the pods wasn’t the best idea? Three of seven are dead and none of them are flying yet. Awesome start. We should farm or something. The next day all of the remaining butterflies have emerged, dried their wings, and survived the pool. They are flying repeatedly into the side of the plastic box trying to fly away. Really violently and steadily into the side of the box. At first I didn’t know what the thumping sound was but it was the butterflies. The girls liked watching them for about 4 minutes total but the cat was another story all together. The cat stared for hours on end at the box of victims. I wonder if the surviving butterflies could see the cat and feel panic? I kind of wanted to turn them loose and watch the cat go crazy but we had made it too far. Success was going to be achieved. Just at the apex moment where we felt like maybe, possibly this adventure could be counted as a success one of the girls asks a key question. So we went to the kitchen and everyone got a treat to distract them from the butterflies’ fate. We purposefully bought living things in the dead of winter with the sole outcome of nurturing them into butterflies that we could watch die horrific deaths of suffocation, crushing, drowning, and starvation. It is like we are the mastermind behind the Saw movies but with butterflies. Maybe for the sequel I can grow them inside a microwave with a motion sensor. For now I will just watch the one remaining butterfly as he lays on a mold slice of banana with one leg twitching, questioning why life would bring him here to die. IT WAS ME MR. BUTTERFLY! I MURDERED YOU AND IM SORRY! He is looking at me and demanding answers for his life. His only friend is dead in the background. So if you have done something educational but ended up questioning your decisions, this post is for you. You’re welcome. :You had me laughing out loud. “…special butterflies. They might have to be released at night when it is cold….Who wants a brownie?” Kudos for the quick thinking, Underdaddy! But, oh, those poor, defenseless butterflies who gave their lives in the name of education. They valiantly died a hero’s death. I’m so sorry. it sounds funny even though it’s quite tragic. I hope the girls don’t have a hard time accepting the loss. “Maybe we should start farming” is hysterical. I grew up in a house very similar to yours (but replace all girls with mostly boys) and we had the dried tadpole experience, the dead ant farm experience, the cat ate the mice and the hamsters, but my one insight is this: stay away from birds. Don’t ever get birds. Oh we also had these butterflies, but they never even became cocoons. Mealy worms were the most successful of all the mail order bugs. Like sea monkeys aren’t enough for us humans, we need to see all of the little animals grow and die on display. The ants were disturbing. I blame the ant farm dealers. They know perfectly well children will treat that farm like an etch-a-sketch yet the ant farm continues to be promoted and sold. Also, like we don’t have enough ants around us that we must buy an entire farm of them??? Oh i have a bird story… I don’t know if I have told it on here or not but birds is out there. OK, after a horrible start to what is going to be a heckuva week, you had me choking on laughter with this. We had to convince M that the cat we had at the time ate the fish out of the aquarium instead of admitting they were slowly throwing themselves into the water filtration system. I swear I don’t remember freshwater aquariums being that difficult when I was kid! Oh my god they broke our aquarium constantly and only a funk of green coated everything did we know what happened. Every time. That is awesome and I hope you have a better week than it started.